Kunio Kenmotsu (Okayama, Japan) observed SAO146362 (lambda Aquarii) by video. When plaing back the video tape, he found a faint star appeared 0.9 second before the appearance of main component. He sent me a .CSV file analyzed by Limovie. It is considered that the detection of component is sure. The radial velocity is 0.499arcsec/second then it is considered the component is distance 0.46arcsec from main star in direction to perpendicular to lunar limb. The magnitude of component is difficult to measure because the pixels of main star are saturated. 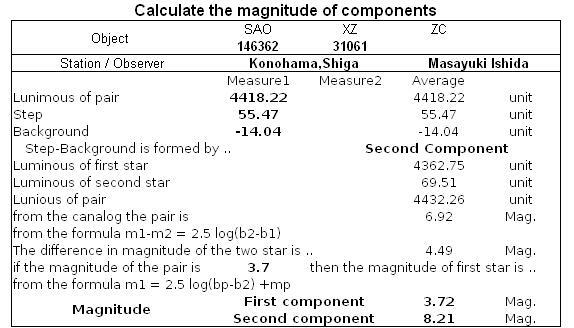 Below is a rough estimation of component's magnitude. The main star is known as a variable star. If the main star is 3.7 mag., then the component is 8.2 mag. or fainter.